Gas and acidity are signs of indigestion. Gas occurs when bacteria in the large intestine ferment food that was not digested in the small intestine. Acidity occurs because digestive acids move into the esophagus, causing a burning sensation called heartburn. In Indian Ayurvedic medicine, acidity and gas are due to an accumulation of ama, or toxins, from undigested food, according to herbalist Penelope Ody. 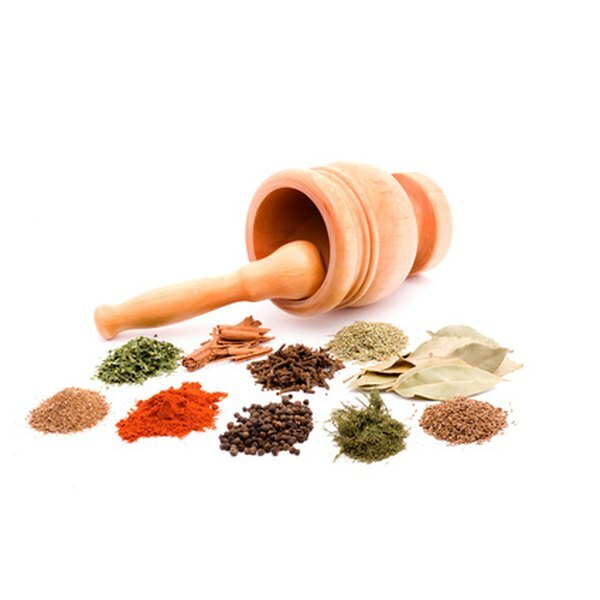 Indian herbs can be home remedies for gas and acidity, but consult a doctor before beginning herbal treatment. Neem, or Azadirachta indica, is an evergreen tree with fragrant white flowers found throughout the Indian subcontinent. Indians consider it a sacred tree and use all parts to treat a range of disorders, including skin diseases, malaria, hemorrhoids, gastrointestinal disorders and intestinal parasites. In Ayurvedic medicine, pitta is a body force associated with eliminating metabolic waste products. When pitta is out of balance, there is excessive burning, odor and pain, as in heartburn and gas. Neem leaves correct pitta imbalance, according to herbalist and Ayurvedic practitioner Alan K. Tillotson. In his 2009 book, “Medicinal Plants: Chemistry and Properties,” botanist M. Daniel says that neem flowers, which contains several carminative chemicals, are used for indigestion. Studies are needed to confirm the traditional use of neem for gas and acidity. Neem oil should only be used externally, and not by children or pregnant or nursing women. Fenugreek, or Trigonella foenum-graecum, is known as methi in India, where it is widely cultivated for cooking and medicine. Ayurveda considers fenugreek to be a warming herb, according to herbalist Penelope Ody. It soothes the stomach, stimulates liver bile necessary for digestion, and relieves gas and heartburn. In their 2009 book, “Medicinal Plants of the World,” Ben-Erik van Wyk and Michael Wink call fenugreek seeds a digestive tonic and say they are rich in mucilage, a thick substance that forms a protective coating for mucus membranes and improves digestion. Ayurvedic practitioner Alan K. Tillotson also recommends fenugreek seeds to strengthen digestion. Studies are needed to support the Ayurvedic use of fenugreek seeds to relieve gas and heartburn. Fenugreek should not be used if allergic, during pregnancy, with anticoagulant drugs, or in large doses. Consult an herbalist for dosage safety levels. Turmeric, or Curcuma longa, is a yellow rhizome, or underground stem, used in Asian cooking for its color and health benefits. Known as haldi in India, turmeric has a long history of use in Ayurvedic medicine. Turmeric is rich in polyphenols, essential oil, polysaccharides and sterols, and has potent antioxidant, digestive and anti-inflammatory properties. Healers use it for a wide range of diseases, including peptic ulcers, indigestion and skin disorders. Like neem, turmeric also helps balance the body’s forces and restore normal digestive function. Ayurvedic practitioner Alan K. Tillotson says that turmeric stimulates the liver and regulates bile flow, improving digestion. He recommends turmeric for patients with inflammatory bowel diseases, like Crohn’s disease and ulcerative colitis, where gas and heartburn are common symptoms. Studies are needed to verify the use of turmeric for digestive disorders and to determine the safe dosage level.. Turmeric may have side effects for people who are pregnant, have skin allergies, or have heart, liver, gall bladder or bleeding disorders, so it is important to consult a doctor before taking turmeric.